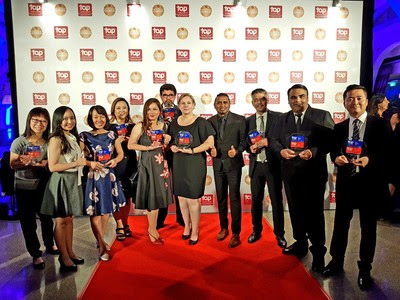 SINGAPORE – Media RAJAWALISIBER – 12 December 2018 – DHL Express, the world’s leading international express services provider, has been named 2019 Top Employer for Asia Pacific as well as nine countries and territories in the region: Australia, Hong Kong, India, Malaysia, New Zealand, the Philippines, Singapore, Thailand and Vietnam. The award was conferred by Top Employers Institute, a global organization recognizing excellence in employee conditions, making this the fifth consecutive year that DHL Express has received the award for Asia Pacific. This further establishes the company as a regional leader in employment practices and talent development, with a workplace culture built on respect, recognition and equal opportunities. 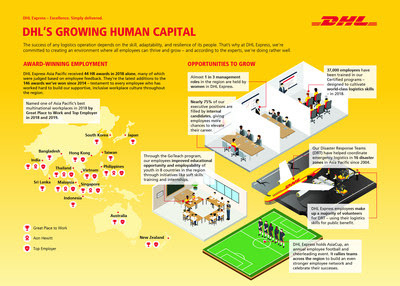 The Top Employer award has consistently recognized DHL Express’ sustained investment in talent growth, including its Certified International Specialist (CIS) and Certified International Manager (CIM) programs that have trained, to date, over 60,000 employees in Asia Pacific. This series of training is meant to create a powerful sense of community that enables employees to combine best-in-class product quality with incomparable service excellence. In 2018 alone, DHL Express received a total of 44 awards for its workplace and corporate culture in Asia Pacific. This year’s string of accolades are the latest additions to the 146 other awards that DHL Express Asia Pacific has received since 2014, many with strict judging criteria based on employee feedback. DHL Express was named Best Employer 2018 for Asia Pacific by human capital firm, Aon Hewitt — an accolade conferred to DHL Express which has won this recognition in five other countries across the region: India, Malaysia, Philippines, Singapore and Thailand. In Asia Pacific, DHL Express was also ranked second on the list of Asia’s Best Multinational Workplaces 2018, by Great Place to Work®. DHL Express has been recognized as the sixth best place to work globally in a 2018 employer ranking from Great Place to Work® and FORTUNE. In addition to the CIS and CIM programs, DHL Express regularly organizes activities that celebrate and recognize employees’ dedication, and cultivate employee engagements at all levels. These include initiatives such as ‘Staff Appreciation Week’ and ‘Employee of the Year’. Most recently in August 2018, DHL Express held its DHL AsiaCup in Singapore — an annual employee football and cheerleading event involving more than 1,000 employees, to rally teams across the region to build an even stronger employee network and celebrate their successes. Next articleTOPI AWAN DIATAS GUNUNG SEMERU JAWA TIMUR FENOMENA ALAM ATAU PERTANDA ?